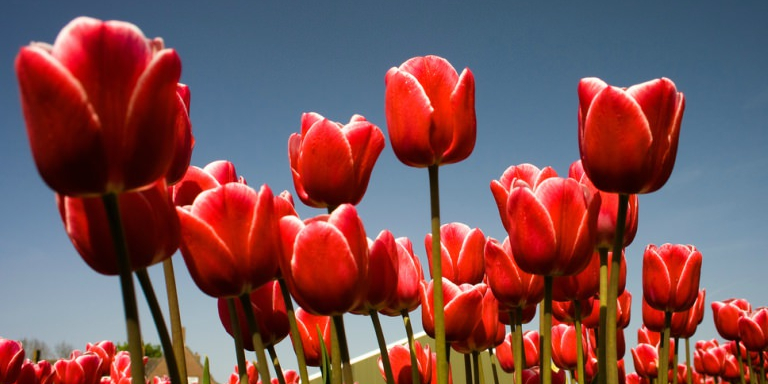 Who doesn't want to find themselves among the blossom of Dutch tulip fields? Or experience the authentic European Christmas with snow, ice-skating, and mulled wine somewhere in Brussels? Or maybe relax on the beach of the North Sea watching the ships sailing across to England? Of course, Benelux countries have a lot to offer regardless of the season, so let's find out what your options are when you travel to the Netherlands or Belgium depending on the season. You have probably come across lots and lots of photos depicting colorful Dutch tulip fields with mills and tiny cute houses amidst them. This is how spring looks like in the Netherlands! Precisely, it is from the middle of April to mid-May when the tulips strike with color. However, tulips are not the only ones that paint Holland bright: from mid-March, you can see the crocuses, then daffodils and hyacinths, eventually followed by famous tulips. To provide our travelers with the best experience, we include a trip to the fields of Keukenhof in our small group tour of the Netherlands and Belgium. Colorful spring in Holland is not limited to flora. Prepare for the "orange madness," or Koningsdag (King's Day) on April 27, which is, in fact, the biggest party in the country by all means. Apart from the streets "painted" orange, you will find a lot of fun, including various street sales, plenty of options for family entertainment, day and night parties, and of course beer. Continue your tour to Belgium. Although March can still be a bit moody there, April brings in the full-blown spring to the streets and houses. Actually, April is the sunniest month of the year in Belgium while the temperature averages at +14 °C (57.2 °F). We suggest you immerse yourself in the blossom of Middelheimpark in Antwerp or visit the largest Japanese Garden in Europe in Hasselt. Brussels is another place not to miss on your tour of Belgium and the Netherlands in spring. The amount of greenery, botanical gardens, and parks per square meter is impressive with Meise Botanical Garden, Royal Greenhouses of Laeken, and Tervuren Park being the most famous. Summer in Benelux is a great fit for those who appreciate warm but not killer hot weather allowing comfortable conditions for sightseeing. If you travel to the Netherlands in summer, include the Hague in your itinerary. This coastal city which is also a seat of Dutch Parliament and home to the Royal Family will certainly touch your feelings. My personal favorite place in the Netherlands, the Hague, has it all! Really, come and see for yourself! One of its indisputable benefits is a seashore with a boardwalk beautifully decorated by the best local spacial designers and architects, plenty of options for entertainment, and relaxing atmosphere. Are you a cultural tourist? Again, welcome to the Hague! Home to the Court of International Justice, a centuries-old seat of the Monarchs and the Parliament, this city is also famous for its artistic side. Discover the masterpieces by the best Dutch painters in Mauritshuis containing the Royal art collection, or go beyond classics and visit some of the modern art galleries. Amsterdam is Amsterdam and is not to be missed on your summer tour to the Netherlands. If you travel to Belgium in summer, we suggest you start your discovery in medieval Bruges filled with lively colors but always bearing its authentic darkish atmosphere. Then make your way to Brussels, and enjoy select Belgian beers sitting in one of the open terraces which can be found all over the city. They say when in Rome do as Romans do, so it's a must! Of course, Brussels in summer is not only beers and terraces but also music. Lots of music! Check out the schedules of some major music festivals and events in Belgium online or ask your travel specialist before you embark on your tour to Belgium and the Netherlands. Note: Don't be fooled by comfortable temperatures and the sun when in Benelux! Always have an umbrella with you, as it rains a lot throughout the year. Should your vacation in Europe fall in autumn, we recommend you try and push it to the first half of the season (September to mid-October). This will allow you to get the best out of your trip. My personal experience of traveling to the Netherlands in the end of September was great, and unless you aim to see the legendary tulip fields, I would say early fall is the best time to visit Benelux countries. Again, based on my personal experience, Christmas is a good time to visit Benelux countries simply for the unique holiday atmosphere you can find there. Weatherwise, it might get tricky though, depending on the area. While in the coastal areas it gets chilly due to high humidity levels, somewhere in Brussels the temperature is mostly comfortable (but it rains, a lot!). We suggest you pack a warm, water-resistant jacket and a pair of winter boots - this way you won't get distracted from the magic around you. By the way, did you know that Belgian and Dutch kids are blessed to have 2 Santas? Yes, that's right, these kids enjoy double sets of presents! Sinterklaas or Saint Nicholas usually arrives from Spain 20 days before the actual Santa Claus and greets the children with delicious gifts. Apparently, the children can also send a letter to Sint and receive their replies and gifts by mail. Whenever you travel to Benelux, you will enjoy it. Are we sure? Yes, we are certain! However, for the best experience, make sure you follow one simple rule: pack something warm, an umbrella, and a raincoat. Join one of our private or small group tours to Belgium and the Netherlands and go hassle-free. Contact us for more information.